The most important thing you can to help your child in math this year is to focus on mastering all multiplication facts as quickly as possible. Please use the following multiplication tests to quiz your child. 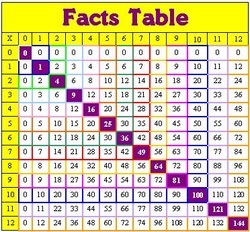 Students should be able to complete 100 facts in 5 minutes or less. Remember, you can print your Homework from home! Be sure to have your USERNAME and PASSWORD ready. If you have forgotten your username and/or password, please email me so that I can send you the information.